"Numerous towns and districts in the Midland counties are famous for special and distinctive industries, chiefly in the manufacturing character, but they are not unique in the sense that we can speak of the industry of rose growing being unique at Burbage, near Hinckley, for this is unquestionably one of the greatest centres of rose culture in the world". From an introduction in the 1923 Trade Journal for Hinckley and District. In 1773 Benjamin Hurst of Cosby saw the potential for a horticultural business and set up the Burbage Nurseries on land in Sharnford and Burbage initially supplying hedging for the enclosing of fields. The Hurst’s were also seed merchants and became important employers in the Village. Members of the Methodist Church they were the main benefactors in donating the land and building the present church. The Grove, the family home and some of the Nurseries were situated on land that is now Grosvenor Crescent. On the site of the Burbage Infant school in 1908, Benjamin’s great great Grandson, Charles Chamberlain Hurst set up the Burbage Research Station. 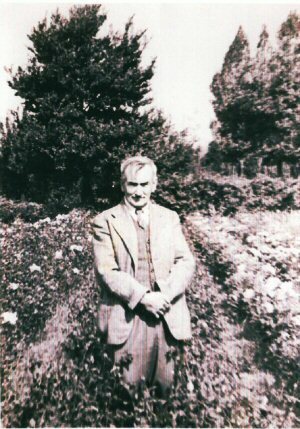 His aim was to use the then new science of genetics to make horticulture more efficient and profitable. Studying the principles of hereditary he was the first to prove Human eye colour brown dominant to blue. After the First World War in 1919 he built up an extensive rose collection of over 2,000 varieties attracting visitor’s world wide. In 1921, it was Major C. C. Hurst who supplied the rose garden at the War Memorial providing a named rose for every man who had fallen. In 1922, C. C. Hurst married his second wife; Cousin, Rona Hurst of Earl Shilton, moved to laboratories at Trinity College, Cambridge and published a number of books including The Mechanism of Creative Evolution in 1932, a world renowned Publication in genetic research. C. C. Hurst died in 1947 & wife Rona continued to write up his works into the Hurst Collection at Trinity College, Cambridge until her death in 1980. The second largest Nurseries in Burbage were the Victoria Nurseries situated on Coventry Road. Herbert Robertson the son of a framework knitter was born on Church Street in 1884 and educated in Burbage. At the age of 13 he left school to train in a number of private gardens in the south of England. In 1911 he returned to Burbage and opened a small nursery on Coventry Road the land which now runs down to the M69. A prolific breeder of pyrethams, delphiniums, apples and roses, such was his contribution to the development of garden plants that the Royal Horticultural Society awarded him the Veitch medal and in 1956 he received an MBE for services to horticulture. He gained several medals from the Royal National Rose Society and was created vice president in 1957. At his small nursery he bred many roses that became household names, some were named after his family and local people, and others characters from opera's of which Herbert was a great fan. He exhibited at all the National Shows and had contracts with the American company, Jackson’s to supply rose seedlings. 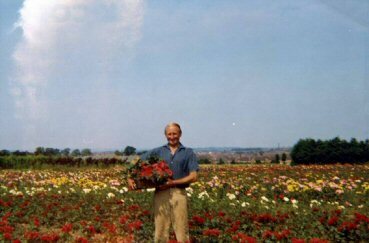 Percy Robinson brother to Herbert ran a small but busy nurseries in land off Cotes Road, he was also a florist and specialised in chrysanthemums and operated up to the 1950s. 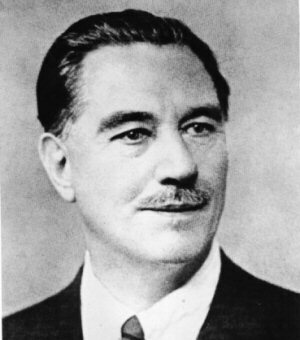 Herbert died in 1977, aged 92. The nurseries and land was then sold for building Robinson Way and some of the roads were named after his award winning roses, Westminster, Alesworth, Coral and Villia. A close neighbour to Herbert Robinson, Bill Truslove started growing sweet peas in the 1950s. 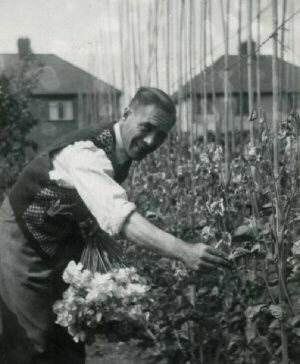 Born in Burbage in 1914, Bill was a keen amateur gardener and exhibited at many of the national sweet pea shows where his new varieties were eagerly awaited. In the 1980s he started to send his own cultivars to national trials and was awarded silver medals on six of his plants - Odds On, Jayne, Amanda, Dean Handel, Anniversary, Miss Truslove and Helen. Before his death in 2004, Bill carried on growing sweet peas well in to this century. 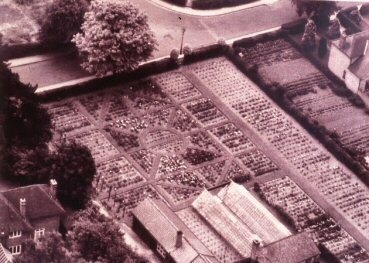 In July 1946, the Burbage Allotment and Gardening Association held its first meeting in a room at the Sycamores Inn, Burbage. Ideas were shared and goods sold at a discount. There were two shows a year one in July for sweet peas and another for chrysanthemums in September. In 1991, the society opened the Greenaway Building as a base for trading. 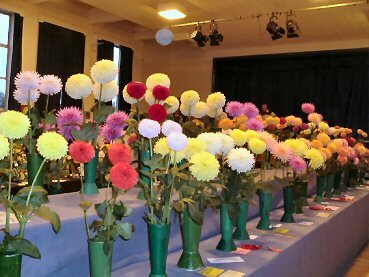 The club, with over 400 members, now named the Burbage Garden Club due to the decline in allotments meets monthly, produces a newsletter and holds the annual Burbage Show.